The OptoDisc Inkjet printable media is perfect for robotic autoloaders because it helps prevent the discs sticking together. Using robotic autoloader duplicators are a far more convenient and expedient method of duplicating discs, especially for larger jobs. But they cause nothing but aggravation if the media sticks together and causes the unit to stop production because the inkjet printable media youâ€™re using is too sticky and 2 or more discs are stuck together when loaded into a drive. 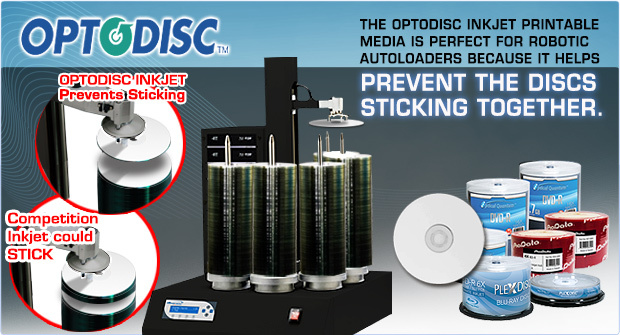 OptoDisc Inkjet Printable media is made with a special coating that prevents the discs from sticking together preventing an autoloader from picking two or more discs due to a stickiness factor. If you want to make sure your project that requires inkjet printable media is duplicated smoothly and successfully each and every time, donâ€™t take chances, use any brand of OptoDisc produced inkjet printable media for peace of mind and the assurance you wonâ€™t be burdened with a stopped job due to media sticking together. For more details about this or any of Vinpower Digitalâ€™s product line, visit our website at www.vinpowerdigital.com or contact a Vinpower representative near you. Last week you may recall that Vinpower introduced its line of Blu-ray Copy Protection duplicators that added a strong security of protection against copying or ripping Blu-ray content protected by the BCP. With those units, they do require a dongle with licenses for the BCP protection to be embedded onto the duplicated discs. What if wanted to reduce your costs and you donâ€™t need as strong of copy protection, but still want some protection as a good deterrent against the majority of people from copying or ripping the content from your Blu-ray projects? Thatâ€™s why Vinpower created the EZ BD Copy Protection! Using our specialized Blu-ray duplicators with the EZ Copy Protection enabled, as long as you use any brand of OptoDisc Blu-ray media, the system will be able to embed the EZ BD Copy Protection without requiring a dongle or any special licenses or fees. So you can create as many copy protected discs as youâ€™d like without any added costs. The only requirements are that you use a Vinpower Blu-ray duplicator with the EZ BD Copy Protection feature enabled with the excellent quality low cost OptoDisc produced BD media. If youâ€™re not paying extra for the EZ BD Copy Protection and youâ€™re making Blu-ray duplications anyway, thereâ€™s no reason not to add the protection. There are no issues in playback with any BD player that accepts BD-R media, so your customers will be able to play your BD content without concerns. Vinpowerâ€™s certified Blu-ray Copy Protection (BCP) embeds a market leading Blu-ray copy protection and has superior playback across all known players*. 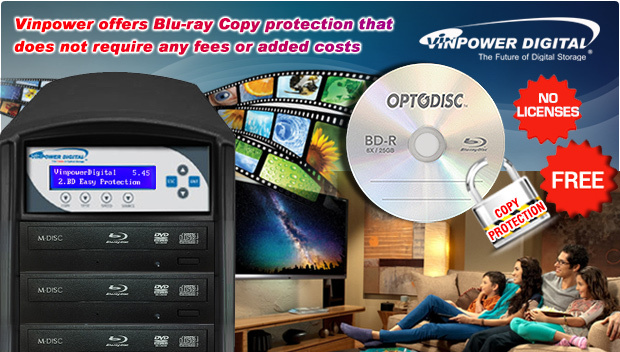 Vinpower has developed one of the most secure Blu-ray copy protection (BCP) applications available. The BCP application is embedded directly into all duplicated Blu-ray content through authorized standalone duplication and publishing hardware that produce any number of 25GB or 50GB Blu-ray discs that includes protection from recipients copying or ripping the content from those discs. The process of adding copy protection to Blu-ray discs was previously not possible, too expensive, or required replications which would require minimum commitments and would also be costly. Vinpowerâ€™s BCP is extremely easy to produce and costs a fraction of what it would cost to use other methods of copy protection. In addition, the resulting protected discs have excellent playback compatibility, ensuring that you can play your protected content across all known Blu-ray players or through all known BD player software available. This is key as whatâ€™s the point of adding protection if the user canâ€™t play the content on their preferred player or software. If you want to true Blu-ray copy protection, only Vinpowerâ€™s BCP can offer you the most secure protection along with exceptional playback at a truly acceptable price point. For more details about Vinpowerâ€™s BCP application, visit our website, www.vinpowerdigital.com or contact a Vinpower representative today. * Includes only Blu-ray players and video software that can play recordable media. 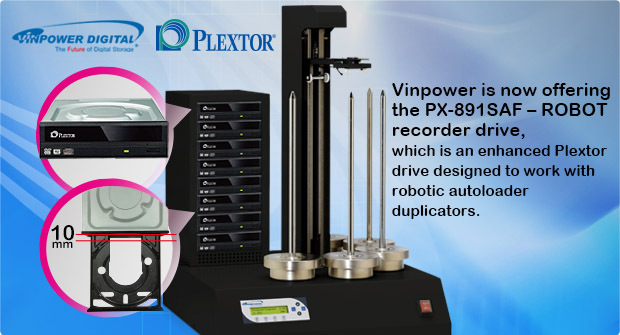 Vinpower is now offering the PX-891SAF â€“ ROBOT recorder drive, which is an enhanced Plextor drive designed to work with robotic autoloader duplicators. Vinpower is happy to announce that the PX-891SAF â€“ ROBOT is now available. Vinpower Digital, a recognized global manufacturer and distributor of digital duplication equipment and accessories, has received the prestigious Plextor PX-891SAF ROBOT Optical Disc Drives (ODDâ€™s) and is the exclusive worldwide supplier with drives already in stock in select markets. Contact Vinpower today if youâ€™d like to order these top of the line drives. â€¢	The Disc loading tray and firmware are designed specifically for automated robotic disc publishing hardware with consistent tray extension. The Plextor PX-891SAF â€“ ROBOT CD/DVD writer drive is immediately available and can be shipped anywhere in the world. Contact Vinpower for more details, or visit www.vinpowerdigital.com to learn more about the benefits and capabilities of this drive. The Instashot Apple iPhone/iPad flash device allows the user to take video and pictures directly to the InstaShot without using any of the iPhone/iPads internal memory. 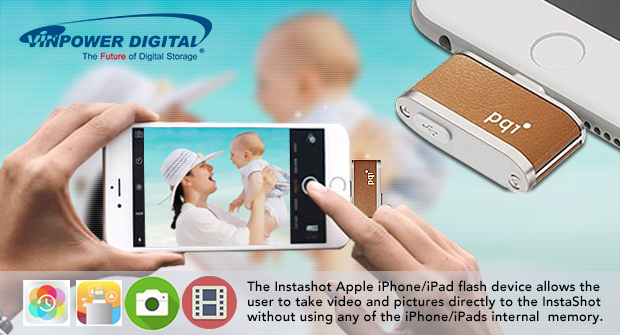 The InstaShot is an ideal companion for owners of iPhones/iPads with a lightning connection as it provides up to 128GB* of added storage. The InstaShot can take videos and photos that donâ€™t use the iPhone/iPadâ€™s internal memory, back-up photos and videos with one touch, protect files and photos with Apple Touch ID protection, and easily transfers content quickly between your iPhone/iPad and a computer or tablet through its high speed USB connection. The InstaShot expands your iPhoneâ€™s storage capacity, especially on the lower capacity 16GB iPhones. The InstaShot allows you to take more high-resolution 12 megapixel photos, live photos, 4K videos, and store them directly in its memory without using up precious storage on the iPhone/iPadâ€™s internal memory. The InstaShot has an extendable Lightning connector that allows it to stay connected to an iPhone/iPad without needing to remove the exterior protective casing. The InstaShot can take live video and photos that are loaded directly to the InstaShot, without using any of the internal memory from the iPhone/iPad. In addition, the InstaShot allows you to pause the video and add fun filters to add excitement to your videos, all during the filming process. The InstaShot allows the user to backup images and videos with the push of a single button. The InstaShot is so fast that it can back-up over 1,000 pictures captured through the iPhone/iPadâ€™s camera and transfer it to the InstaShot in just over 4 minutes. InstaShot lets you easily transfer and share files on all your devices without needing to interface through iTunes or iCloud. Share content stored on your iPhone/iPad directly to your computer or from your computer on to your iPhone/iPad, via the iConnectâ€™s Apple-certified Lightning connector or USB connection. Easily back-up your data from your iPhone/iPad to your Mac or PC, or transfer media and other files from your Mac or PC onto your iPhone/iPad. The InstaShot is engineered to meet Appleâ€™s design specifications and are MFI (Made for iPhone/iPad/iPod) Certified. For more details about the InstaShot or any products Vinpower Digital manufactures or distributes, please visit our website www.vinpowerdigital.com or contact a Vinpower representative in your area.